This post will be edited whenever I have time to add items or update their statuses. Please reply if you have something to say. Also, please be patient, we're working on fixing everything. ----------- Done? Maybe add other prefixes? Do you happen to know if Guest posting will be allowed again in the (near) future? @faqbot: I don't know. Will add it to the list. Will email notification for replys be enabled? Currently, it shows the checkbox but you can't select it. @maul.esel: I had already reported this issue, but forgot to mention it here. Added to the list. For example,make 3 rows with some text and try right clicking below that third row. What about lost "AHK" attachments? Will they be restored? I don't get it. I can't figure this new forum format at all. I can't figure out how to display topics i started. I can't figure out how to display a topic, given it's number. I can't figure out anything.... and where is it documented? The last forum format was very intuitive. This one is hopeless. im getting that msg on pm's to users im having an on going conversation with! how come? WYSIWYG post editor shows font size in pixel increments (8, 10, 12, 14, 18, 24, 36, 48) yet the underlying BBCode shows font sizes in what appears to be HTML increments (1, 2, 3, 4, 5, 6, 7, 8). Any way to fix this so that BBCode matches the WYSIWYG editor (or vise versa)? If given a preference, I vote for pixel increments. The characters immediately before and after "Instructions" were 4 space characters and the forum converted them to a single tab character. In code, tab characters are not the same thing as multiple space characters. - Old Private Messages are not removed when deleted. 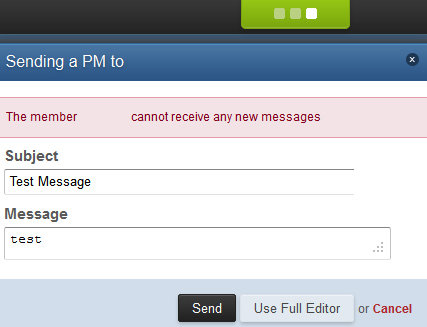 - Unable to send any Private Messages at all. I can reply but have not confirmed they are received. - Also the Ajax loading animation at the top: http://cdn.autohotke...jax_loading.gif continues after the window is closed.